You ever watch those Discovery Channel shows where they talk about the Chicxulub asteroid or the Tunguska event? There's always Neil deGrasse Tyson or somebody talking about how some big asteroid event will happen again... eventually. They really don't know how likely something like that is. But, even though they don't know, they've just increased the chance around six times. One report from Space.com -- who knew that space had its own Website? -- says it's 10 times more likely. The Weather Channel says 4-5 times more likely than previous thought. Well, apparently, asteroids are now weather phenomena, like rain and snow. But, it also means that, while the likelihood of a major meteor strike is unknown, new studies show that it's even more unknown. And more in a bad way. As in I don't know how big the spider that crawled out from underneath the dash of the car is, but there's four of them. And I'm in traffic. So, that's not good. Well, if we're eventually gonna get hit by an asteroid, maybe we can make it less painful for everyone. Remember Christo? The guy that used to wrap stuff in plastic? Not the guy on TV selling you a food vacuum packer, but the guy that took big pieces of plastic and surrounded islands and such with it. Well, he could wrap Washington DC with a big plastic red ring. Then a little ways further out, a bigger ring. Then a little ways further, an even bigger ring. Who knows? Maybe some big honkin' asteroid will fly by, see it, and head to it like moths to a flame. Then, we'd be clear for another 30-100 years from a decent size asteroid. And clear from those idiots in Washington. I don't see a down side. so if asteroids are like weather does that mean they will be attributed to man made climate change? Yes, Basil, but if an asteroid hit Washington, would it impact Obamacare? Hey, I like my congressman; he offered to hand-carry some paperwork to the Pentagon for me; the one from the next district over I think should be replaced. One of my senators needs to go for certain. 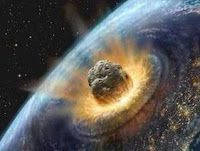 @4 Jimmy, would it take an asteroid to repeal the Affordable Care Act? Wouldn't that be overkill? Could we just tell them it's a plastic ring (to keep out the rubes from Flyover Country) and instead make it an airtight bubble? And install it during the next State of the Union address so we don't miss anyone? I'd miss the Capitol, but we could rebuild it. As long as the rings don't extend to Iowa, I'm fine with it. We rubes from Flyover Country don't want to visit either of the coasts, anyway. 4 to 5 times more likely? 10 times more likely? These people are just trying to calm and placate the masses. If logic is applied to the situation, you will realize that the probablility is very close to 100%. It's the timing that is questionable. All I can tell you for certain is that we are a few minutes closer than when I started typing this. Hey, it's either that or falling in a black hole. An asteroid hitting Washington will leave a deep impact. The only question is will it be deep enough? We need total annihilation!! Either that or send in the Kraken! Well, we didn't get hit by a asteroid today, so that means it's twice as likely to happen tomorrow, right? Isn't that how probability works? why haven't we implemented a meteor strike redistribution program yet? ?